Installation of Dr.Web anti-virus – quick and easy! IMPORTANT! 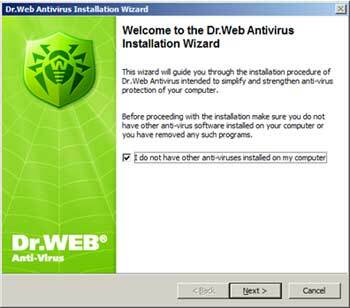 Please make sure that no other anti-virus is installed on your computer (including other Dr.Web products) before your proceed with installation of the Dr.Web anti-virus service software. 1. 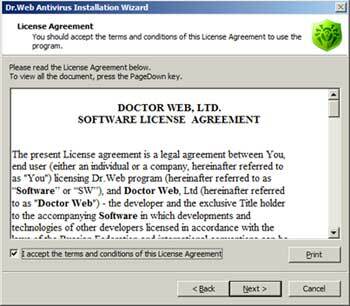 Sign up for the service and use the generated link to download the Dr.Web installer (about 1100KB). Make sure that you remember its location. 2. Double-click the avdinst.exe file to launch it. Caution! 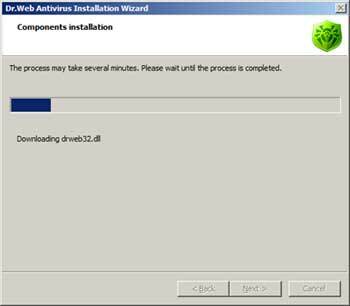 Dr.Web anti-virus software is subject to constant improvement. The actual installation procedure may differ from the description provided below. 3. Read the license agreement text. Press Next to accept its terms and continue the installation. If you do not accept the terms, the installation will be aborted. 4. In the subsequent window you can choose the type of installation. Quick (recommended) – the easiest way to install the software. All parameters are set automatically. If you have chosen Quick installation, move to step 6). 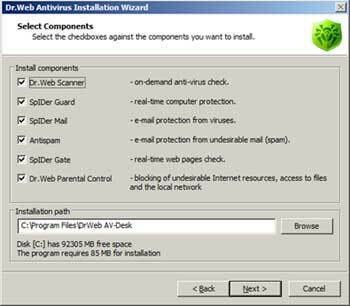 Custom – this type of installation allows you select components of the anti-virus software you want to install. АAdministrative – this type of installation allows most thorough customization of the installation process allowing to change all installation parameters. 5. If you have chosen Custom or Administrative you now need to select anti-virus components that will be installed in your system (the list of available components depends on your chosen subscription package) and press Next. 6. All other installation procedures will be performed automatically. 7. To finish the installation press Finish. Reboot the system and wait while the anti-virus connects to your service provider's anti-virus server. You have installed the service software successfully. Your computer is now protected by Dr.Web anti-virus!